Truth be told, these babies are filled with booze. The dandelion description is in fact dandelion wine flavor. Over a cup of the stuff! Yah yah, so I get off on baking boozey cupcakes - from ouzo cupcakes with sour cherry cream cheese frosting to Lemon Limoncello Cupcakes, not to mention the Grand Mariner ones. I don't make cupcakes for kids and please never give R. Kelly my number. The dandelion wine was made by my boss who spent a lot of time picking flowers in random fields of Pennsylvania. The stuff is tedious to make, and not cheap if you want to buy it - nearly $50 a bottle! I was tempted to add more fun ingredients into the batter, but didn't want to mess with the precious dandelion essence. So, the only altercation was using coconut oil instead of regular 'ol vegetable oil. Ultimately, these cupcakes reminded me of the Greek keik. The kind of cake found in every Greek homebaker's household to be had with afternoon coffee - a cake that is not too sweet, but just enough to make you feel happy and not take your teeth out. If you don't have dandelion wine and don't live in Pennsylvania where fruit (non grape) wines are more common than grape wines, use a sweet riesling. I bet that would be awesome! Also, I'd play up the icing next time, and go with a lavender icing or orange blossom water icing for some contrast. Cheers! Preheat oven to 350 degrees F. Grease muffins tins or cake/loaf pan. Blend all Ingredients for cake in a bowl together with a beater until smooth. 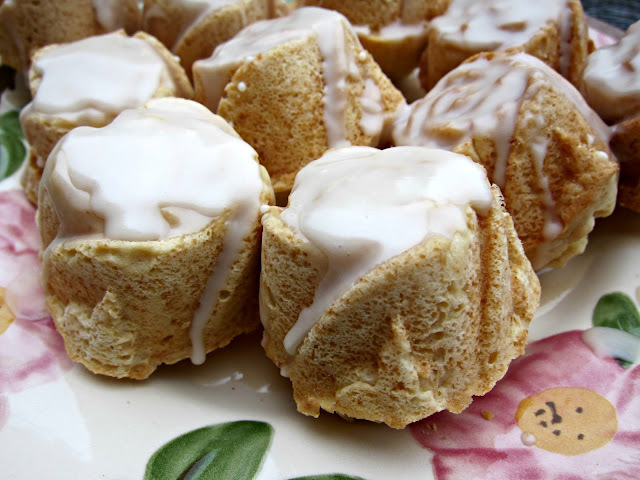 Pour into cups/pan and bake for about 25 minutes for cupcakes and 40 minutes or less for a loaf. Blend all icing ingredients up until smooth and spoon on top of cake - let cool to solidify. Finally! ;)...I've been waiting to see these! I need to find myself a bottle of dandelion wine, because I really want to try these as-is...dandelion wine just sounds so...I don't know...primal? Love it! p.s. also, must try the ouzo cake. Mmmm. These look awesome....get your wife on and make a batch for hubby for brekkie. So happy to find you here! Your cupcakes are intoxicating haha! I would definitely love to dive onto them! Very cute! I like the idea of adding the dandelion. The cupcakes sound divine. You know that in Greece we add wine in cookies so why not in cake. How cool are these? I've never heard of dandelion wine and again you creativity shines here Anna! Hetaher - yeah, my boss picked like 5 trash bags full of dandelions to make the wine. That is primal! Peter - Hah, actually I brought all to work and he came home looking for some.. whomp! Katerina - Now that would be fun to dive into some cupcakes! Anna - Thank you - it's all credit to the rose shaped tins. Ivy - Yeah, why not add to keik? Peter - Ah, thank you and yeah, I just heard about the dandelion wine when I got to PA - since then I've seen it around a few times. What a difference 2,700 miles makes!